When UW-Green Bay Professor Regan A. R. Gurung (Psychology) has something to say, people usually take notice. The passionate and engaging psychology professor, who was recently honored with a national teaching award by the American Psychological Foundation, is at it again. The TEDx talk that he gave to a packed audience at the Thelma Madoff Center for the Arts in Fond du Lac this August, is now available in its entirety here. CHILL (Take time out from an emotional event to let your biology return to normal). DRILL (Practice specific productive ways of thinking to modify automatic thoughts that are unproductive). Of the approximately 90 people who applied with a lengthy application to speak, 20 were interviewed and 14 were finally selected. Gurung said his audience was responsive to his talk, which lasted just shy of 18 minutes. TEDx typically focus on a local community and with local voices in the “TED” format. TED is a nonprofit organization devoted to spreading ideas, usually in short, powerful talks (18 minutes or less). It began in 1984 as a conference where technology, entertainment and design converged.) Today it covers the gamut of topics from science to global issues in more than 100 languages. Independently run TED events help share ideas around the world. TEDxFondduLac’s inaugural event was on August 19, 2017. Tickets went on sale May 1 and were sold out in about six hours. The theme, Fear Forward, was a driver for attendees to think differently about preconceived fears, judgments and thoughts. In the photo — a UW-Green Bay ‘Intro Psych’ reunion of sorts. 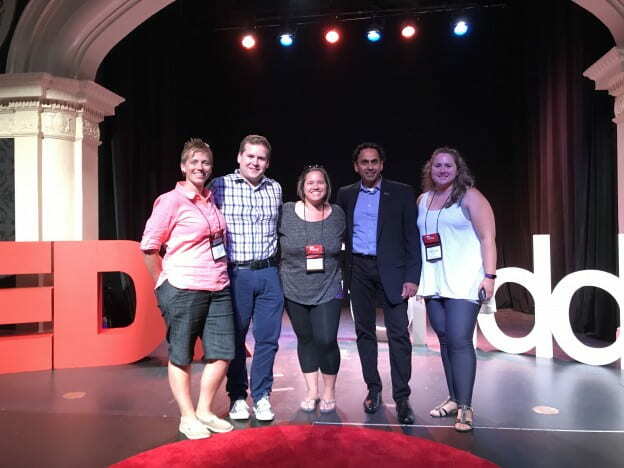 From left to right, Jen Keene-Crouse (Keene) ’04, Shawn Pollack ’04 (who was also a TEDx speaker), Angela Duckert (Stangel) ’03, Prof. Regan Gurung and Michelle Weyenberg ’05. Photos taken by Brian Kolstad Photography of Fond du Lac, Wisconsin. This entry was posted in Leading & Learning and tagged CAHSS, Human Development, Psychology, Video on September 20, 2017 by Sue Bodilly.